Protect the contacts of module's connectors and ZIF socket from contamination. Any dirt and/or fat on contacts may cause errors during programming. Proceed with care! Incorrect insertion of device in module's ZIF socket may lead to programmed device damage. Unscrew 2 knurled thumb screws. Properly Insert programming module into Programmer Module Interface connectors, until it clicks. 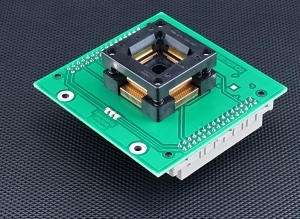 Due to connectors shape, only one orientation and position of programming module in Programmer Module Interface connectors is possible. Screw 2 knurled thumb screws to fix programming module to programmer. Push the cover of module's ZIF socket (the topmost movable part) to open the socket. Insert the device into module's ZIF socket. Correct position of programmed device in module's ZIF socket is indicated by picture near (usually on left above) the module's ZIF socket. On that picture, reference corner of device (e.g. position of pin 1) is indicated by dot, by number 1, by bevelled corner or by any combination of mentioned. Then release module's ZIF socket. Visually check the placement of programmed device in module's ZIF socket. If everything looks OK, the device is ready for programming. To take out the device from module, push the cover of module's ZIF socket and remove the device. When you finish the work with module, unscrew 2 knurled thumb screws and remove the module from Programmer Module Interface connectors.